Branded Character Interview and Am I A Real Person!?! Wait? Back-to-back posts from me? Couldn’t be! I know, I know . 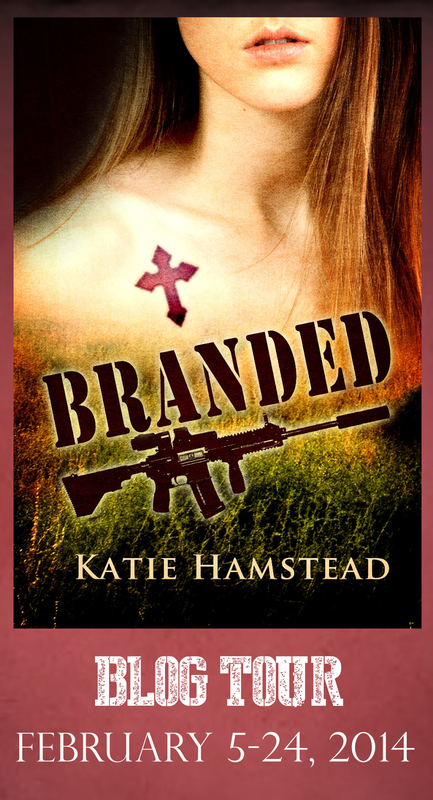 . . but I’m shaking things up a bit for Katie Teller/Hamstead in honor of her new release this month, Branded. Her characters, Ali and Nick, have stopped by for an exclusive interview! Q: Tell us a little about yourselves. Ali: Ah… I’m Ali, and I’m not an alcoholic. Nick: Smart A. I’m Nicholas Qasim, I’d barely finished my bachelors at the University of Technology, Sydney, when the attack happened. Ali: Let’s not talk about that. Q: You two went to the same high school, but were never friends then. Why do you think that is? Ali: He was two grades above me, and a super nerd. Nick: *Laughs* Yup, I’ll take that; gaming, comics, anything nerdy you can think of and that was me. She never would have talked to me if I’d tried. Ali: You don’t know that. Ali: Okay, yeah, I probably would have blown you off. Q: You guys are best friends now. Do you think things would have been different if you’d become friends before Ali met Damien? Ali: Maybe. Nick’s an awesome guy. I mean, yeah, in high school I would have ignored him, but I think if we’d met up after I graduated we would have been friends. He’s as loyal as they come. Who doesn’t want that? Q: What is the earliest memory you have of each other? Nick: Her walking into school with her older brother, Andrew, who, by the way, is more of a nerd than me. Nick: All of us guys thought she was a hottie and wondered why Drew had her with him. Ali: They have no taste. Nick: Anyway, later she had tons of girls surrounding her, but Drew seemed to have vanished. A few days later we found out he hated having her at the same school as him and hid to avoid being associated with her. Ali: My earliest memory of Nick? Hmm… let me think… probably around the middle of ninth grade, so his eleventh grade, I remember him getting this math award. The school made a huge deal about it, and presented it in front of everyone. I think it helped you get your scholarship, right? Ali: The school made a big deal out of that, too. But he was pretty shy about it. Unlike me, he didn’t thrive in the limelight. Nick: Didn’t they have you and the choir sing at that assembly? Ali: Ahh… Oh, no, that was the vocal ensembles. So yes, I sang. Nick: I loved that. Ali is the best singer, you should hear her. Ali: *Scoffs* I am not. You’re totally bias. Nick: Nope, you’re the best. People would stop what they were doing to listen to you. I remember being late for class several times because you were practicing for something or another. Q: So, one last question: What do you want to do if/when the war ends? Nick: Repair the bridges that have been broken. I hate the thought that people will hate me and my family and other like us because of everything that’s happened. Fear will make things like this happen again, so I hope to bring understanding and peace. Ali: I just want to live my life, have a family, and enjoy being free without fear. I want to keep the people I haven’t lost with me for the rest of my life. Sounds like a good plan! I mean, war, what is it good for? Absolutely nothing! Also, visit Katie’s site to enter her Rafflecopter giveaway! 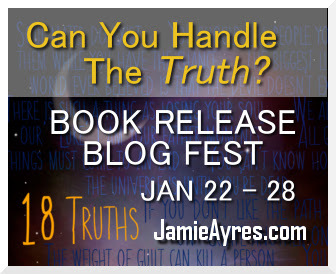 And once again, I want to thank everyone for supporting me on my 18 Truths Blog Tour and playing along! I’ve contacted everyone personally to let them know they’re winners, so if you’re here looking for the prize list, it’s up at the top right-hand corner of my site ^ . . . $25 Amazon gift card and my swag pack were the first prizes to go! What do you think of Ali and Nick? If you have time, I’d appreciate a visit over at Jennifer Eaton’s blog. She asked me an interesting question today: Am I A Real Person? You be the judge 🙂 Also, my publisher is making the Kindle version of 18 Things only 99 cents tomorrow for a BookBub promotion . . . I’d really appreciate some social media shout outs to help move it up in the rankings! THANK YOU! !